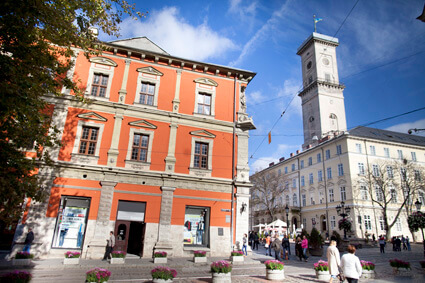 Taras Burhan Law Office LLC is situated in the ancient heart of the city in front of Ratusha (City hall) in 16th-century Renaissance building. There are plenty of cozy restaurants and cafes around 5 minutes’ walk from our office, so we can discuss your issue in less official atmosphere (subject to adherence to privacy and confidentiality rules). Also there are two parking places at Katedral’na (less than 1 minute walk) and Mickiewicz (around 2 minutes’ walk) squares.